Jo joined Business Stream as Customer operations director in May 2016, a role vital to strengthening Business Stream’s senior team in advance of the opening of England’s water market. With an extensive background in customer service positions, Jo’s role will be key in achieving Business Stream’s aim of providing industry-leading customer service both in Scotland’s established market and when the English market fully opens to competition. 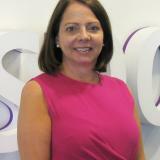 Before joining Business Stream, Jo was Head of customer experience at Standard Life and has previously worked across both the utilities and financial services sectors. Check out the incredible speaker line-up to see who will be joining Jo.